UPDATE: We’ve been told that the example seen in the photos here is an S-Hybrid, based on the tail lamp configuration. It’s promising to be a very active year in terms of new vehicles entering our market, and by the looks of it, the fourth-generation Nissan Serena may be one of the many entries. Reader Richard saw this C26 heading towards Salak South from Sungai Besi earlier, and duly snapped a trio of photos. Tip of the hat to you, sir. Indonesia is getting the C26, so it wouldn’t stretch things too much to get it in here as well. Over in that market, the eight-seater MPV is going up against the likes of the Mazda Biante, which debuted at the Jakarta show last September, as well as the Toyota NAV1, the local variant of the Noah minivan. The petrol Serena is powered by a MR20DD 2.0 litre direct injection mill offering 147 hp at 5,600 rpm and 210 Nm of torque at 4,400 rpm; it’s paired to a Xtronic CVT gearbox. There’s also an S-Hybrid variant, which mounts an stronger starter motor to increase power output and power generation capabilities. An extra battery fits in the existing engine compartment. The JDM petrol version features an Idling Stop system, VDC, TCS, ABS and EBD plus Brake Assist, Hill Start assist as well as curtain and side airbags on its equipment list. Hv u all trace the trade-plate ? TC or grey importer ! Comparing serena n innova – lack of wisdom!! Definitely TC, logically no way it will be grey importer! So far I haven’t heard any grey importer bring Nissan Serena before. TC so slow… Nissan should look for alternative dealer!! Long absence of this model. The C24 old Serena can retire from malaysia market. almost a decade, is it? Just price it the way they did with the old Serena….. and nothing more! Pls don’t follow Stream, Wish or Mazda5 pricing. Then it shall fill the gap between those MPVs and Innova. I would buy one. Oddly, at a glance the rear seems to look like the Proton Exora. Agree. I wonder why somebody has a lousy eyesight. Serena and this jaguh kamping are really two distinctive design. By the way since our ‘grandpa’ tc can get a hybrib model? Sincere Exora rear end looks better than this. Sincerely Exora rear end looks better than this. the trade plate confirm belongs to TC. A good start for Tan Chong. But me still waiting for Sylphy 2nd gen which already selling in Thailand to upgrade my car. This thing would look more “upper-class” if it has projector headlights. saw this in hong kong for a while, friend told me it was a serena. i didnt believe him. not exactly good looking but definitely much better than that serena we had. however, being tan chong….they tend to screw up everything. I will get this new one instead of looking for re-cond like Estima. the estima & serena level no same. if level of drive, sure is estima. Judging from teana n almera sales, tan chong should have more confident in launching serena c26 in malaysia…. Please do not compare kimchis with sushi. Worthless rotten cabbage vs Blue Fin Tuna? But the fact is,here in malaysia sushi is more well-known compare to kimchis. Not to mention the resale value and the maintenance. Kimchis for me is just a beautiful flower vase. Not much useful especially in the road condition in east Malaysia. The problem with TC is their love to assemble everything and they’ll end up with dinasour models like C24 Serena and Sentra from early century, 1999 to be exact. Bring in CBU la TC. Instead of bring 3.7/3.5 better offer 2.5 Murano, Elgrand. Big cc of 3.5 is deterrent. Why should delay Thailand Sylphy? Just rename as Sentra or Pulsar and cease dinasour Sentra from TC lineups. Don’t flame me yet, juz wanna share what I know. TC being independent assembler, they have a contract for each model they acquired for CKD. Meaning for an X model, they have to pay Y price to assemble Z numbers of units. Also means that if they haven’t sold the minimum Z numbers, they can’t get a new model. I’m not all sympathetic coz they might continue production for other reasons (lower cost, higher profit, expensive new tools etc.). But it helps to understand other probable reasons behind their stand of keeping old models. Else ask Nissan to directly invest lor. Which they’re not doing becoz of NAP and setting up factories elsewhere rather than Bolehland. That’s why you guys cannot be in the car business. 1) launched rather late, within the SEA region. 2) has the lowest spec model. have you seen the almera…?? we need to understand with Malaysian policy on CKD cars taxed a lot lower, the franchise distributors have little choice other than to bring assembly kit to Malaysia, which can cost millions of ringgit. imagine how long it would take them to breakeven. This is the reason new models were launched at a much later date, which is quite obvious with Tan Chong with the Latio, Teana and now this C26 Serena. They were quick though with the X-Trail 2WD, perhaps being ASEAN CBU from Indonesia…and the Sylphy. From the looks of its rim and bumper, definitely it is a Highway Star variant. Sold here in Japan since 2010, but now already an obsolete model. Since Aug 2012, Highway Star only available in 4WD or hybrid only, except for low-spec 20S variant which still available in 2WD. In 2.0L minivan sales, Serena is currently at no.1 ahead of Toyota Noah/Voxy and 3rd place Honda StepWgn. Fuel consumption according to JC08 cycle – Serena 13.6 km/l, Noah/Voxy 13.6 km/l, StepWgn 14.8 km/l. nissan did not, but TC is!! nissan did, tahts why they alomst went bankrupt in late 90s, then later rescued by Renault which becomes its owner now. just fired ang boon beng,bring the nissan new model to malaysia damn slow! If we fire Dato Ang,the Malaysian will not even get the new Almera.He is doing his best.Thing before you comment,little kid. Saya nampak Serena ni dipamerkan di Grand Indonesia Mall di Jakarta lewat tahun 2011 yg lalu…saya dapat tengok dari dekat dan terus berangan nak beli jika ia sampai di Malaysia…dari pemerhatian saya…ia memang jauh lagi cantik dari model yg ada sekarang…lebih rendah dan sedikit lebar…hiasan dalam juga lebih moden warna hitam membuatkan ia kelihatan lebih berketerampilan…dan memang betul yg ia adalah highway star…saya suka Nissan! Malaysian would consider this over the non-hybrid version. yeah, i am seriously considering if its a hybrid. Wondering why good MPVs for commoners’ use is so expensive in Malaysia . Excessive profiteering ? Well..looking into the cabin from the back, seems like you’re entering a space ship! Btw, if am not mistaken, i’d seen one on the federal highway..looks good on the road and i chase it up to Subang airport exit..probably grey imports? Already here in bintulu, saw it from last 2 years already, maybe bought trough labuan becoz got LXXXX reg. num. So far Malaysia has skipped C25 Serena only, finally C26. C25 only for japanese market. At last, Serena C26 is coming here. After my long comment last year on that outdated C24. Let see now who will start 1st; Serena C26 or Nav1. I will buy 1 of these. 1st come 1st serve! And those recond Toyo thru grey importers will die. Buy new, u get full warranty. Buy recond, u face risk. Price shud be below RM150k. It will reasonable. Gud luck Nissan.Start sell b4 CNY, there will be a big order waiting. Start eyeing Rawang factory or Segambut yard if the model already there. nice front design, van lookalike rear design..
Evilia – 7 seater minivan, launching very soon, very economical price but expect bumpy ride, rear using leaf springs..
C24 selling at RM140K +, that one already very old stoc, this one how to be cheap? Anyway, in bolehland where got cheap car, Proton also expensive. A long-overdue good quality MPV yet to hit out shore. Flipped through a HK magazine some times ago and saw an article comparing the people carrier with Toyota Noah and Honda Stepwagon – it offers the most quiet cabin and softer-side ride with reasonably good handling. Resale value wise it may lose to its competitors but I still personally favor over it. In Japan This is a S-Hybrid! the malaysia one is not hybrids ? Price below 150k is reasonable. I won’t buy Estima in that case. Dear Fukuoka, do you know what Toyota Estima is used for in Japan? Why so many recon came to Malaysia? Do they belong to tour agency or are they used as taxi before coming to Msia? stop selling C24 and launched C26 not too long ago. Unofficial info – launching 2nd quarter of this year. C24 uses multi-link rear suspension but C26 uses torsion beam, a setback, less comfort n poorer handling.. I had drive this car at Brunei before. Quite powerful and the fuel consumption good also. With very high spec thing. Two auto slide door, plasmacluster Air-cond, Adaptive Front Lightning System. But this car is tall and easy affect by the wind. Pual like to know this serena c26 is the sliding door auto.or like the ols serena manual can check on this. 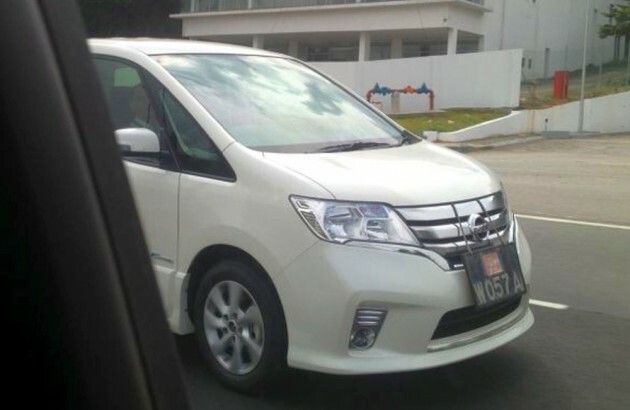 Any news about this MPV from Tan Chong etc? Nissan told me c26 under study !? bila mai c26..nk booking ni..
Tan Chong told me will be launched sometime mid of the year. Until now no news nothing…. advertisement also tak ada. Bump into SA for my Grand Livina (GL) previously at the Nissan Road Show at shopping centre just now. I told him i am looking for my 5 years old GL replacement and the leaked new GL doesn’t looks good. He told me can consider this Serena Hybrid coming after June. Btw, the new GL replacement will be launched end of year. Insider information, confirm launching in July 2013, hybrid versions included. Pricing not yet confirmed.